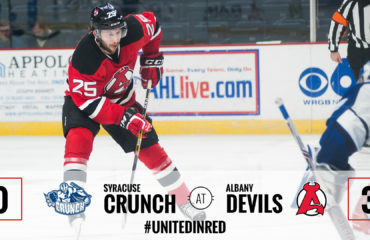 ALBANY, NY — For the first two games of the season, the Albany Devils avoided playing from behind. 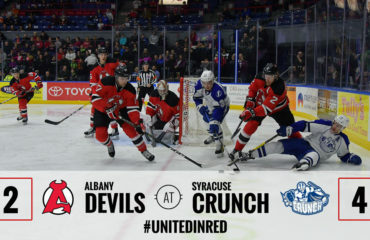 However against the Binghamton Senators Friday, the Devils had to erase two deficits — early in the first period and again in the shootout with the game on the line. Both times the Devils were able to claw back to skate away with a 3-2 victory to improve to 3-0-0-0. The Senators held a 1-0 advantage in the shootout after two-and-a-half rounds. Down to their final skater, Devils’ rookie John Quenneville tied the score with a wrister past Chris Driedger’s glove. After Ken Appleby made back-to-back saves, Blake Pietila won the game during the fifth round. In his first start, Appleby finished with 26 saves for his fourth career victory. Offensively, Ben Sexton and Seth Helgeson provided the regulation scoring. 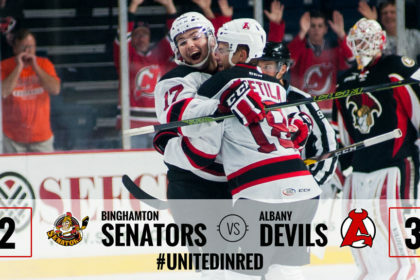 Sexton’s first tally as a Devil came at 8:44 of the opening period just two minutes and 33 seconds after Binghamton’s Ryan Rupert had made it a 1-0 game. Sexton and linemate Rod Pelley, who assisted on the play, both extended their points streak to three games. Before the intermission break, Nick Lappin and Carter Camper connected to find Helgeson high in the offensive zone. The Devils’ d-man sent a shot through a screen and behind Driedger at 14:37 of the same period. The tally was the sixth of Helgeson’s career and first since Jan. 15, 2016 at Providence. 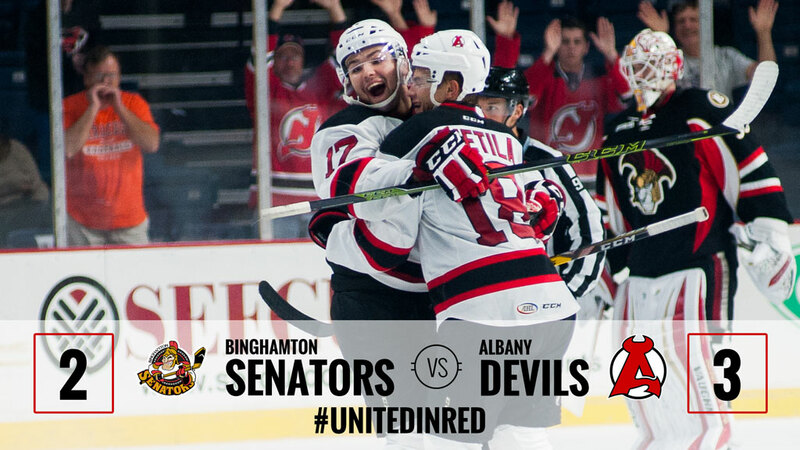 In the third, Binghamton’s Curtis Lazar tied the game, picking the upper-right corner from the left face-off dot at 8:15. 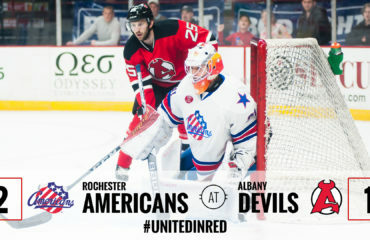 Albany returns to action Saturday against North Division rival the Utica Comets. Puck drop is at 5 pm.